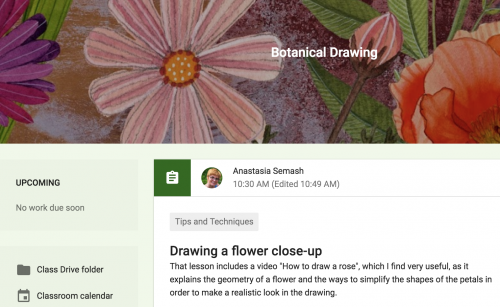 We use Google classroom for sharing information about the classes content, which includes syllabi, homework assignments, handouts for the lessons, useful links, students’ questions and more. Students can be invited to join a class through a private code. For children’s classes the invitation will be sent to parents. Each class creates a separate folder, where the student can submit work or read teacher’s notes and even watch tutorial videos. For children’s classes I will also post the updates about what was happening in the class, what topics were covered, etc. The purpose of creating an online classroom is to help more effectively use the real classroom time, learn additional information and catch up the topics from the missed classes.That also means additional work both for student and the teacher outside the classroom, which means more practice and learning about art.